The Royal Photographic Society (RPS) has launched a Call for Entries for the world’s best scientific and engineering images. Open to scientists, students and the public, one hundred images will be selected by a jury of scientists, photographers and experts, to form a touring exhibition that will launch during the British Science Festival in Bradford in September 2015. 5) Award for young people aged 17 and under (a voucher worth £500 to buy a camera and/or photography equipment). 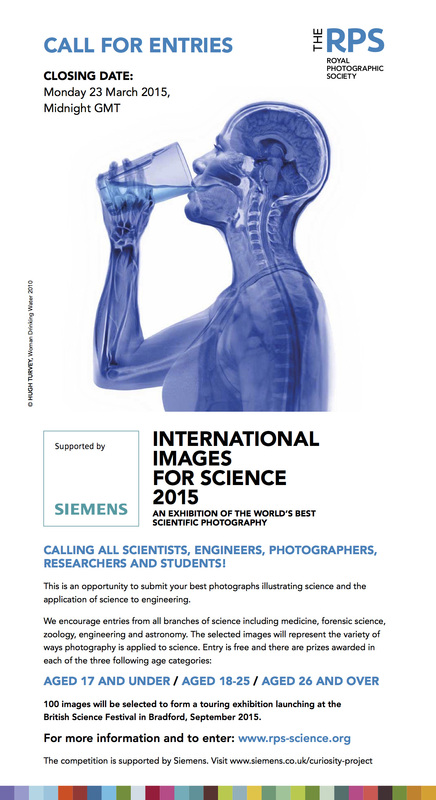 Images will illustrate how photography can inform and aid discovery in science and engineering. Entries are encouraged from all scientific fields from medicine and forensic science, to engineering and astronomy; every branch of science that uses the best imaging technology or illustrates photography’s scientific value. Juergen Maier, Chief Executive, Siemens plc, said: “Siemens is proud to support the Images for Science competition and exhibition which will help to boost the profile of engineering, science and innovation. As a global pioneer in innovative and environmental technologies, Siemens needs bright young people who are fascinated by science. Two previous International Images for Science exhibitions have been held in 2011 and 2013 and received wide international acclaim. Both showcased images ranging from atomic structures to distant stars from medical subjects to nanotechnology and the devices used to support the work of scientists. International Images for Science focuses on the documentation of scientific experiments and equipment using photography and the use of imaging techniques to measure science. In the past, the Vesalius Trust has received some very nice entries for the Dr. Frank H. Netter award from Australia. We hope there is continued interest within your membership for this award. Our next submission deadline is December 5, 2014. As always, there is no entry fee. We provide recognition to projects that are innovative in they way they communicate medical or life science information. A call for entries is attached and examples of award winning projects can be seen on the Vesalius Trust website (http://www.vesaliustrust.org/grants-scholarships/the-dr-frank-h-netter-award/). Can you please let AIMBI members know about the award and deadline? We would be honored to consider applications from your members.